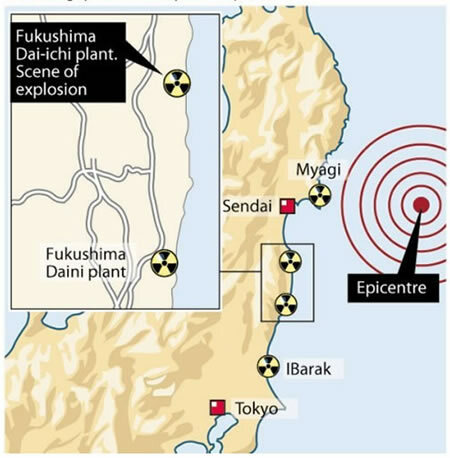 Japanese Nuclear power plant buildings exploding virtually every other day has sent a shock wave across the worlds stock markets that effectively crashed the japanese stock market by 11% which set in motion a chain reaction of stock market meltdowns across the world. Japan in many respects has been lucky in that the winds continue to blow the radioactive clouds away from Japan out across the pacific. However the nuclear crisis is far from over, with worsening news by the hour of now including partial meltdowns of multiple reactor cores, cracks in the containment vessels and a fire in reactor 4. 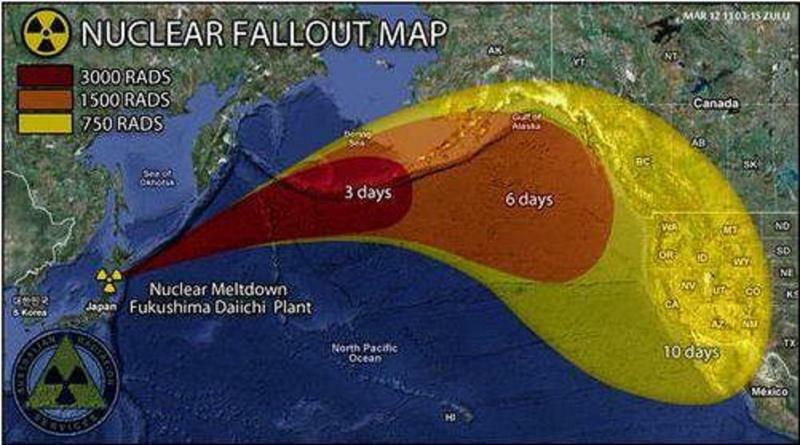 The below graph estimates the consequences of what a full blow meltdown and subsequent explosion of a Fukushima nuclear plant reactors would imply in terms of radiation fallout for western Canada and the United States. Japan's crippled economy continues to suffer from power cuts, with infrastructure damage estimated costs ranging all the way upto $1 trillion. Whilst the Earthquake was bad, and the Tsunami many times worse, however Japanese nuclear power stations exploding chernobyl style in this densely populated country would be a doomsday scenario that would change the economic equation for Japan for more than a decade, which had already been fighting hard to pull its way out of a 20 year long economic depression. Japan's stock market crashed by 10.6% to close at 8,605, down 17% over the past 2 days. Japan's central bank responded by pumping in another $90 billion liquidity on top of Monday's $160 billion by means of making loans available to financials and buying of Japanese bonds and stocks. Japans economic future hinges on the actual outcome of the Japanese nuclear plants crisis, if total meltdown can be averted then ironically Japan's GDP could rebound quite strongly after the initial slump as infrastructure including whole towns are rebuilt. Meanwhile everyone waits and watches the outcome for at least 4 Japanese nuclear reactors. In terms of the global economy Japan's huge 20% of GDP Loss, is not expected to have any lasting impact as basically Japan after 20 years of stagnation is not as big global player that it once was, therefore at worst this will hit global GDP by 0.2%. FTSE opened sharply lower in response to Tokyo's crash, down by more than 3% before beginning the slow climb off of the morning low as the index tracked a more stable Dow into the close to end down 1.4% on the day at 5,615. The Dow has continued to show relative strength against other stock indices as it continues to play out a relatively orderly corrective trend following its peak of some 4 weeks ago. Will this black swan event impact on long-term western stock market trends ? My next in-depth analysis will seek to update the trend expectations for the stock market for the rest of 2011, which will now also take into account the implications of the unfolding nuclear and economic crisis coming out of Japan. Ensure you are subscribed to my always free newsletter to get this analysis in your email in box. I am really looking forward to your analysis on the current correction in world markets and how things may unfold. Hi Nadeem, in your opinion will this be a long drawn out correction, as like April to August last year. Or a relatively sharp and brief correction in terms of time? My understanding is that it will be relatively quick due to so much cheap money flooding the system and QE2, also if it is a 10% correction, being down 5/6% already suggests that it could hit bottom relatively quickly? What are your thoughts on the duration of the correction? I'm looking forward to your stock market analysis Nadeem. What is your current opinion on the outlook for uranium stocks? Do you think this event will have long term implications that will delay any renaissance in nuclear energy, or do you think this will create a good opportunity to buy uranium stocks? The best times to buy are usually when everyone else panic sells. Uranium is part of the commodities a long-term inflationary mega-trend of rising prices. Today for obvious reasons everyone is turning anti-nuclear, but tommorrow it will be how to combat global warming. I aim to come to a conclusion on stocks over the weekend so probably send out Monday or Tuesday as it will be incorporated into a new ebook. Though my primary focus for the next few of months will not be stocks or commodities but the UK housing market. I am going to have to re-evaluate what I am doing, cos this is turning out to be a bloomin nightmare i.e. the interest rate ebook AND stocks stealth bull market analysis combined in one. I need to complete one before I can properly focus on the other, so it is unlikely I will be able to complete the stock analysis this weekend, now looks like a job for next weekend. Despite best attempts by Japanese govt. to play down the whole event, isnt this already another Chernobyl. In fact its worse in a way because its like a slow acting but deadly poison. Who in their right minds would want to go to Japan to do business in the foreseeable future? As for the nuclear plants, the situation keeps getting worse. Raditation increases everyday....and now according to some reports, traces of radioactivity can be found in milk in America as well.